Selected by Jeffrey Deaver and Raymond Benson, this is a collection of mystery/thriller short stories from some of today’s top writers. The Cold War—a terrifying time when nuclear war between the world’s two superpowers was an ever-present threat, an all-too-real possibility that could be set off at the touch of a button—provides a chilling backdrop to this collection of all-new short stories from today’s most celebrated mystery writers. 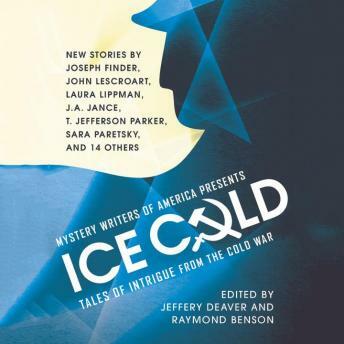 Bestselling authors Jeffery Deaver and Raymond Benson—the only American writers to be commissioned to pen official James Bond novels—have joined forces to bring us twenty masterful tales of paranoia, espionage, and psychological drama. In Joseph Finder’s “Police Report,” the seemingly cut-and-dried case of a lunatic murderer in rural Massachusetts may have roots in Soviet-controlled Armenia. In “Miss Bianca” by Sara Paretsky, a young girl befriends a mouse in a biological warfare laboratory and finds herself unwittingly caught in an espionage drama. And Deaver’s own “Comrade 35” offers a unique spin on the assassination of John F. Kennedy—with a signature twist.